Grane Hospice Care provides a higher level of Hospice Services throughout many communities in Pennsylvania. 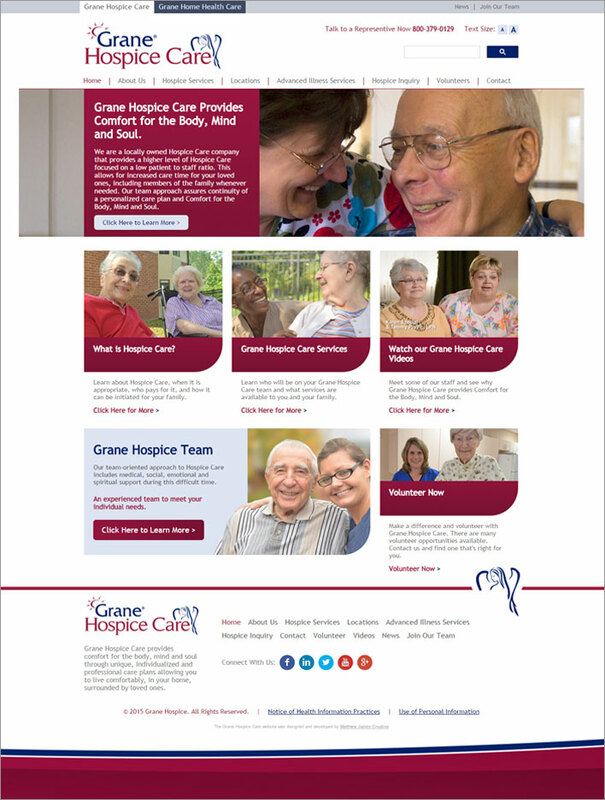 They needed a site that explains what Hospice Care is and why Grane Hospice is different. The site is designed to educate the visitor on Hospice Care then categorizes the variety of services provided by Grane Hospice Care. A series of short videos allow you to meet some of the people behind Grane Hospice. A Hospice Inquiry section allows you to ask specific questions about our Hospice Care for your loved one, friend or patient. A volunteer section, job listings page and dynamic submission forms provide the information needed for Grane to efficiently respond to the community. On-Page SEO programming will help ensure those searching for Hospice Care will find Grane at the top of their list.